You should not forget the rear view mirror in your vehicle, as you should be using it whenever you drive. In older vehicles, the rear view mirror is usually mounted on a pedestal that hung from a mounting point just above the windshield and held in place by two or three screws. Newer vehicles usually mount the rear view mirror on a bracket glued to the inside of the windshield. Both outside and inside rear view mirrors can be damaged in collisions. The inside mirrors usually attached to the windshield glass using a quick bond adhesive. 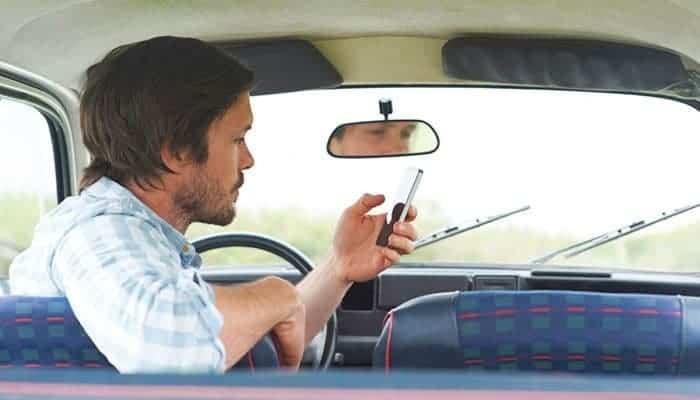 Apart from collision damages, inside rear view mirrors are prone to get knocked from the windscreen, especially if your car is quite old and the mirror has been in place for some time. Refitting an interior mirror is not a difficult job, all you need is the best rear view mirror glue. What Kind of Glue Do You Use for a Rear View Mirror? There are various bonding agents that you can think of. In my experience, rear view mirror adhesive outshines most super glue type bonding ingredients. 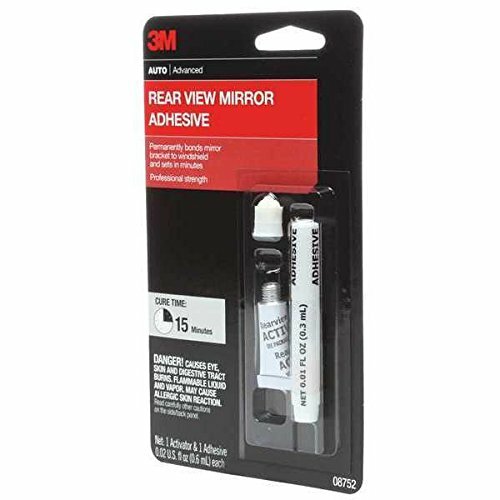 The best and most effective are rear view mirror glue products, such as 3M High Bond Rear View Mirror Adhesive. 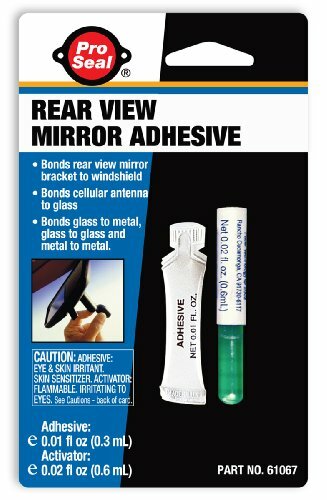 Rear view mirror glue does permanently bond the brackets of a rear view mirror to the windshield in a matter of seconds. The effectiveness of this kind of product does not end there; most rearview mirror glues can be used to bond glass to glass and metal to metal. As I mentioned earlier, repairing a rear view mirror does not have to be a difficult preposition. In fact, you won’t need any special tools to do it. For the best chance of a long-term repair, you need a high quality rear view mirror glue and guidance. You can find a well-equipped rear view mirror glue kit from your local car parts shop, but make sure the kit is up to date and from a reputable brand. Your rear view mirror comprises of two parts that are connected through a ball joint. One part houses the mirror glass, and the other part attaches to the windscreen (the mirror base). The first thing to do is separate the two parts; otherwise, the mirror will be too heavy and will fall off before the adhesive has had the chance to work. The two parts are normally a few inches apart and press back together with a little effort. Sand the mirror base and the windscreen button (metal disc on the windscreen), so that they are completely smooth. Rough surfaces will prevent the glue from making a strong bond. Once both surfaces are completely smooth, remove any dust and dirt from both sides. 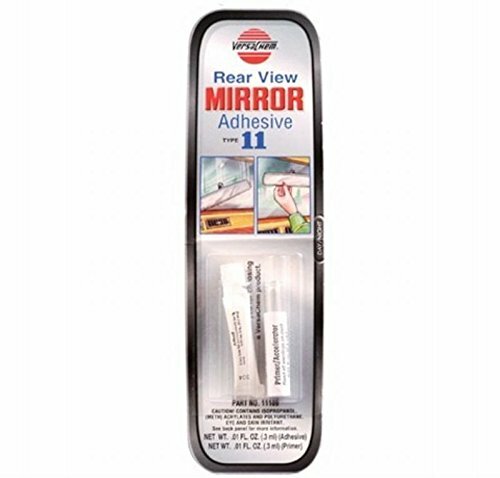 Apply the best rear view mirror adhesive to one or both surfaces, according to manufacturer’s instructions. Press the two parts together and hold in place. Hold the mirror base to the windscreen button (metal disc on the windscreen) for as long as the instructions say to do. Allow the rear view mirror glue to settle overnight before refitting the mirror. After allowing sufficient time for the glue to set, you can refit the mirror to the base, which is now glued to the windscreen. Be careful not to break off the mirror base from the windscreen. Try holding the base in one hand whilst pressing the mirror with the other. This is a specialty adhesive that is made to permanently bond metal to glass. It is the best rated rear view mirror glue in our listing. It is highly recommended for bonding mirror and glass to metal, acrylic, aluminum, and Plexiglas. The Loctite 37438 is translucent amber in color, and the activator is translucent green in color. It has an irritating, sharp odor that may be disturbing. Therefore, you should use it in a properly ventilated area to avoid problems. The application temperature of this adhesive ranges from 50 to 75 degrees Fahrenheit. The specific gravity is 1.05 for the adhesive and 0.70 for the activator. The adhesive has a viscosity of 2100 to 3500 cps, and the activator has a viscosity of 2 cps. The flashpoint of the adhesive is greater than 200 degrees Fahrenheit, while that of the activator is 7 degrees Fahrenheit. Also, the adhesive has a VOC content of less than 4% by weight. The typical service temperature ranges from -10 to 130 degrees Fahrenheit. The application procedure does not require special skills. You need at least 1 minute to set the kit, 15 minutes for mounting, and around 24 hours for maximum curing strength. I find these typical application times to be quite reliable. You should exercise caution when using this kit. The adhesive consists of the methacrylate ester and acrylic acid, which are eye irritants. So, avoid contact with the eyes. It may also cause the allergic skin reaction. The activator is extremely flammable, and it is fatal or harmful if swallowed. The activator does also contain hexane; therefore, it is an eye irritant. Do not use the activator near an open flame, sparks, or heat. Generally, keep the kit away from children. This is a two-part structural acrylic kit that is designed to expertly reattach rear view mirror. It contains methacrylate and isopropyl alcohol activator. Unlike most conventional products, 3M 08749 is highly resistant to impact, heat, vibration, chemicals, and moisture. The 3M 08749 adhesive is clear, and the activator is green. The manufacturer has not stated the odor of this product, but according to my experience, it is not entirely pleasant. So, you should use it in a well-ventilated environment. The ideal service temperature of this mirror glue is between -130 and 230 degrees Fahrenheit. What I like most about this mirror glue is its superb low-temperature curing. Apart from being flexible, it is also highly resistant to thermal cycling. The application procedure is remarkably easy. This kit needs a few seconds for handling, 15 minutes for curing and about 24 hours for tensile strength. It holds up excellently in humid environments and high temperatures. You should take precautions when using this adhesive. It may cause the following: allergic skin reaction; and the digestive tract, skin, and eye burns. It is also a flammable vapor and liquid. Always refer to the products SDS and product label before using. The product has a shelf life of twelve months when stored at the appropriate conditions. You are advised to store it at room temperature. 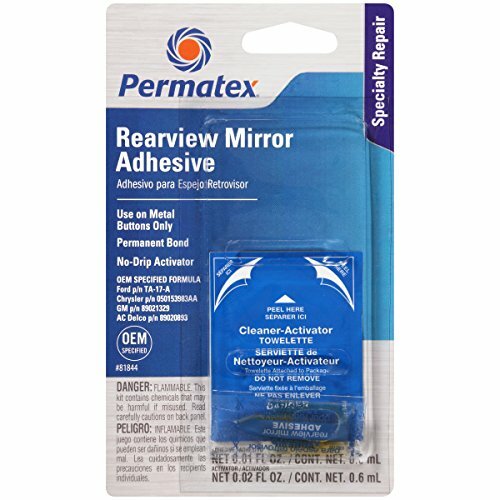 If you are in search of a mirror glue that does not fail, then look no further than the Versachem 11109 Rear View Mirror Adhesive. This unique glue is fast acting and extra strong. It does outshine super glue type and epoxies bonding products. This quality kit is composed of the following ingredients: maleic acid, t-butyl peroxybenzoate, 2-hydroxyethyl methacrylate, and isobornyl acrylate. The adhesive is clear in color and has a mild odor, but the manufacturer does not provide the odor threshold info. It has a boiling point/range of greater than 300 degrees Fahrenheit and a flash point of greater than 199 degrees Fahrenheit. It has a vapor pressure of 6 mmHg at 86 degrees Fahrenheit, the vapor density of greater than 1, and a relative density of 1.06. There is no data available on the reactivity of this product. This mirror glue is stable under proper storage conditions. There are no possible hazardous reactions when used under normal processing, but I urge you to exercise caution to avoid eye and skin contact. In case of inhalation, it may lead to the irritation of the respiratory tract. Contact with your eyes can cause irritation and lead to tearing and redness of the eyes. It may cause dermatitis and/or skin irritation, and may lead to sensitization in case of skin contact. The Rugged Ridge Rear View Mirror Glue is a high performing adhesive that does permanently mount metal mirror buttons to windscreens in a matter of seconds. The kit comes with mixing sticks, sandpaper, alcohol pad, and epoxy pouch. This adhesive is clear in color and has a tensile strength of 3000 psi, which is quite remarkable compared to conventional products. It requires a working time of 1 to 35 seconds and takes about 5 minutes to reach 60% of full strength. It achieves a complete cure in about 24 hours. It contains skin and eye irritants; so, you should practice caution to avoid undesirable side effects. The odor is not pleasant as well. I advise you to use the kit in an open or well-ventilated environment. Regardless of the possible safety issues, you can use the kit to reattach many materials. The application process is super easy. All you have to do is follow the manufacturer’s instructions properly. You will first have to use the primer as instructed and then apply the glue for effective results. When buying the kit, make sure the sticker does not cover the instructions. This is a professional strength repair kit for a falling rear view mirror. With the same chemical compounds as those used by auto manufacturers, the Worktech rear view mirror adhesive offers excellent bonding for metal and glass. It is a two-part mirror glue that permanently bonds your rear view mirror buttons to your car’s windshield. Unlike standard products, this high performing adhesive is easier to use. You do not require special skills to achieve excellent results. The adhesive is yellow in color, and the activator is blue-green. The kit’s composition consists of methacrylate ester. The working temperature range of this product is -60 to 200 degrees Fahrenheit, and has a flashpoint of greater than 200 degrees Fahrenheit. The odor mild viscosity of this kit ranges from 3000 to 5000 cps and has a shear strength of 21.5mpa. The thermo-stability temperature is less than 80 degrees Celsius and has a specific gravity of 0.98. For a successful reattachment, the adhesive requires 30 seconds of setting time, around 30 minutes for mounting strength, and about 24 hours to achieve the maximum tensile strength. You are advised to practice caution when handling this kit. Both the adhesive and the activator are skin and eye irritants. You must use the activator before using the adhesive, and you should keep the entire kit away from the reach of children. 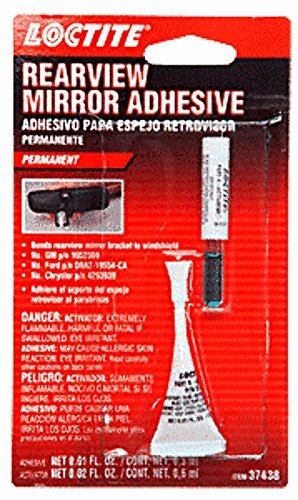 If you are looking for a top quality rear view mirror glue kit that bonds glass and metal in the shortest time possible, then look no further than Pro Seal 61067. Apart from bonding glass to metal, it is also capable of bonding metal to metal and glass to glass. It is clear in color, and its chemical composition includes isopropyl alcohol and acrylate. It has a specific gravity of 1.12 / 0.79; a viscosity of 1000 to 2000 cps; and a tensile strength of 600 psi. The high tensile strength is what makes it a formidable rear view mirror adhesive. The application process is quite simple, and all you will need are the manufacturer’s instructions. It has a fast setting time of 2 minutes, and a full cure duration of 24 hours. It has a working temperature of -65 to 250 degrees Fahrenheit. It has high solvent resistance and high thermal cycling capabilities. According to the manufacturer’s caution label, the Pro Seal Rear View Adhesive is a potential skin and eye irritant, and a skin sensitizer. On the other hand, the activator is highly flammable and irritant to the eyes. You should avoid direct eye and skin contact. This is a two part mirror glue that does an excellent job of bonding metal mirror buttons to windscreens. However, this product is not recommended for bonding plastic buttons. It is OEM factory service specified, fast curing and easy to use. The adhesive is yellow in color, and the activator is blue-green. The chemical composition consists of methacrylate ester. It has a mild odor. The adhesive has a specific gravity of 1.13, a flashpoint of greater than 200 degrees Fahrenheit, and a temperature range of -60 to 200 degrees Fahrenheit. It permanently reattaches rear view mirror to a windscreen, but it is not the best option for reattaching plastic buttons. It takes a few seconds to achieve superior handling strength. It takes about 15 minutes to achieve the ideal mirror mounting strength. This rear view mirror repair kit is not ideal for use in oxygen rich systems, and should not be recommended for strong oxidizing materials. If you are not sure of the proper usage of this product, you should consult the product’s safety data sheet. This product is said to be dangerous and flammable by the manufacturer. According to the manufacturer, the kit contains chemicals that may be harmful if misused. You should also avoid direct eye or skin contact to avoid irritation and sensitization. This is a toughened adhesive system with a medium viscosity. It provides excellent tensile strength for outstanding bonding performance. It will not peel under pressure. In fact, it is formulated for quick and effective curing. The adhesive is amber in color, and the activator is green. The uncured properties of the adhesive include: a viscosity of 30,000 to 40,000 cps at 2 RPM; a specific gravity of 1.05; a flashpoint of greater than 200 degrees Fahrenheit; and moderate toxicity. The curing properties include: the tensile shear strength of greater than 2500 psi and a thermal service range of -60 to 125 degrees Fahrenheit. 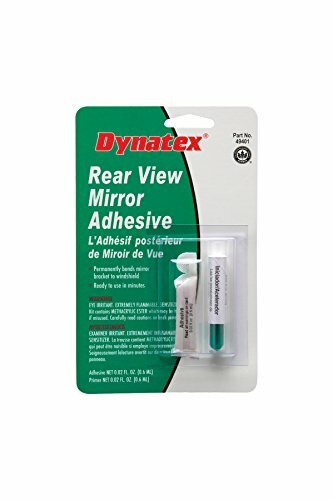 When the Dynatex 49401 Rear View Mirror Adhesive is used along with the activator, you will take approximately 40 seconds for fixing. The curing process may range from 5 to 15 minutes, and you may require at least 24 hours for the adhesive to achieve its maximum tensile strength. However, the fixture time does depend on the gap between the parts you are attaching and the temperature of the parts. In most cases, larger gaps may need more time for superior curing. The toxicity of the adhesive ranges from low to moderate; so, it is wise to use this product with caution. The adhesive is a skin and eye irritant. The activator is extremely flammable and should not be used near a flame or heat. The choice of the best rear view mirror glue is huge in the market, and not everyone can make the best buying decision. Apart from the above-reviewed products, I have prepared a list of the most important factors to consider before buying a rear view mirror adhesive. 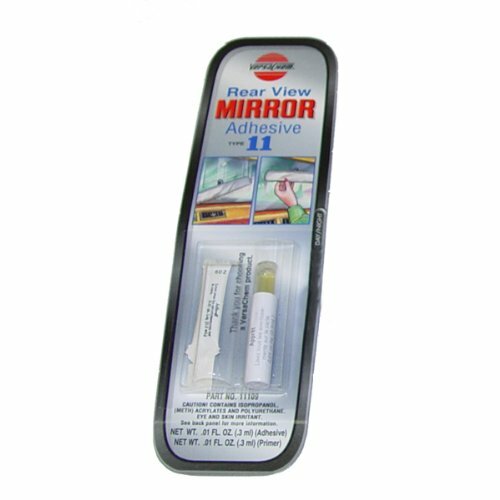 When working on your vehicle’s rear view mirror, you need to choose a rear view mirror glue kit that will produce excellent results. This is to ensure that the glue will hold properly for safety reasons, and the results appear professional. Therefore, choose a high-quality adhesive that is capable of bonding metal to glass. Such a product is perfect for refitting a rear view mirror to a windscreen. Top quality glue should be easy to clean and use, and it should bond in a few moments to give the best results. You should always ask yourself the following question, “How long does rear view mirror glue take to dry?” The best products should take a maximum of 24 hours to produce excellent bonding results. Do not settle for a model that will take a significant amount of time to dry. You can also make use of a hair dryer to speed up the drying process. Personally, I prefer using high-end models that have a good reputation of quick drying. Personally, I recommend an adhesive that has a 10-second handling strength, 2 minutes full strength, and 24-hour full cure. 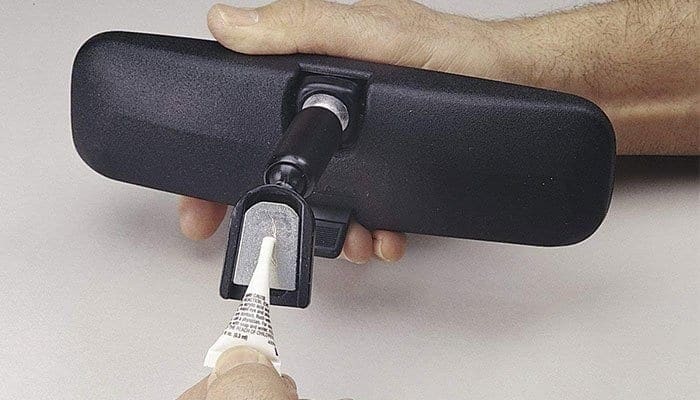 You need to buy a rear view mirror glue kit that has excellent low-temperature curing. It should also be flexible with outstanding resistance to thermal cycling. In my experience, the ideal product is one that has a working temperature range of -130 to 230 degrees Fahrenheit. The best rear view mirror adhesive must be heat resistant. This is so, since the windscreen of your car may be exposed to direct sunlight for extended durations of time when driving or parking. Therefore, if the adhesive is not heat resistant, then the glue may loosen up, detaching the mirror. There are other factors that the bonding glue will be exposed to, including vibrations due to bumpy or rough roads; accidental knocking by you; and humidity due to rain or moisture. So, only glue with excellent resistivity will be able to withstand all the aforementioned factors. There shouldn’t be any debate about the two products, really. Rear view mirror glue is a structural acrylic system that is designed to skillfully mount rear view mirrors to windscreen, and it is resistant to heat, impact, vibration, chemicals, and moisture. On the other hand, super glue is primarily made of cyanoacrylates. Cyanoacrylates are fast acting, which is basically instant glues. However, the cyanoacrylates do not have the excellent properties of mirror glue, such as resistance to heat, moisture, chemicals, vibration, or impact. You should not dare to use super glue on your windscreen. This product can potentially crack your windscreen. It is fast acting, but it does produce too much heat in the process that can lead to cracking. Super glue will also succumb to humidity, moisture, and vibrations. How Long Does Rear View Mirror Glue Take to Dry? Most rear view mirror adhesives take about 1 to 120 seconds for handling, 5 to 15 minutes for curing, and about 24 hours to achieve maximum tensile strength. These time intervals do vary from one mirror glue to another. Are Rear View Mirror Adhesives To Use? Most rear view mirror adhesives are considered hazardous by OSHA Hazard Communication Standard. Most of these products are labeled dangerous and flammable. You are advised to avoid eye and skin contact. 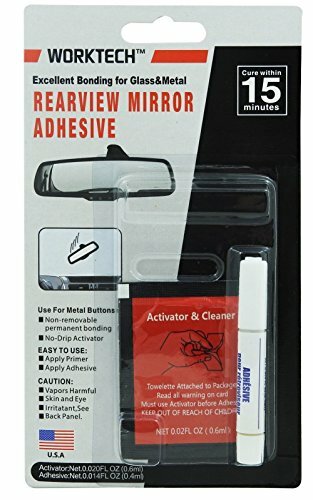 Can I Use a Rear View Mirror Glue Without an Activator? You can, but the activator helps to speed up the handling/setting process. In fact, you will achieve better results if you first apply the activator. Personally, I would prefer to buy a kit that comes with both the adhesive and the activator. All glues are not created equal. From a lot of variations within each category and from one manufacturer to another. With this guide, you should able to make the right choice for a success. Most important part is to choose the best and right adhesive for your needs, be sure to follow the types and safety instructions thoroughly. Give a few of these best glues a shot, I am sure you will find something that you like and that makes your days just a little more productive!